Amazing instrumentalists meet uninteresting songwriting, a massive lack of any soul and an overall effort that is much too long and samey throughout the 63 minutes of high energy, complex death metal. 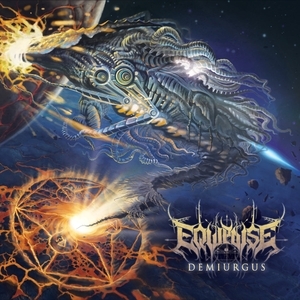 Equipoise is a pretty young outfit but it is very apparent they do not lack drive or talent. Whether it be piano, vocals (throaty lows, shrieks), guitars, bass or piano they are extremely gifted in playing these instruments. It all just feels too ambitious. There is rarely breathing room or any time for ideas to develop. The hyperspeed playing is glorious but it all eventually blurs together and they fail to create that riff, bridge or solo that you want to go back to and revisit time and time again. Further beyond that is the production. It is probably extremely challenging to mix an album where every single player is a star but the piano, strings and bass just feel forced into the limelight at times. There is no problem with a loud bass or piano in this genre but everything feels like it was tossed into a blender at times. Ambitious with obvious potential but it feels like Equipoise lack focus. The only tech death album with bass high enough in the mix. And Hugo is a god.